Sorrowful Mysteries of the Rosary :. Prayed on Tuesdays and Fridays throughout the year; and on Sundays during lent. 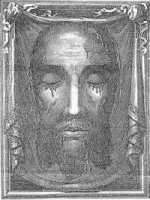 The sorrowful mysteries may be prayed daily from Ash Wednesday until Easter, if desired. 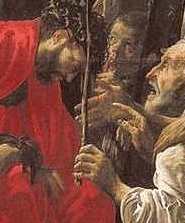 Imagine the lonliness and mental agony of Jesus in the olive grove. Gripped by anguish and fear, He prays that some other way be found, if possible. See His sadness at the fact that those who know Him best cannot watch with Him one hour, in His time of need. Reflect that in His moments of deepest fear and anguish on earth, still He turns to the Father and submits perfectly to His will. Reflect on the physical pain and suffering that Jesus underwent for you. 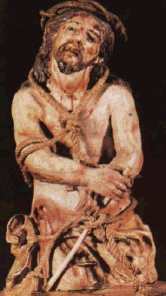 Imagine Him stripped and tied like an animal to a post, beaten with the cruel barbed scourge. Imagine the cruel crown of sharp thorns that was forced upon our Lord's Brow, the patience with which He endured the terrible pain and His submission to the taunts, blows and spittle of His tormentors. 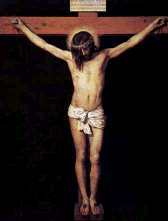 All this He endured especially for you, to redeem you from the deadly results of your miserable sins. Reflect on His courage and the depth of His love. 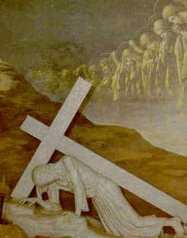 The Carrying of the Cross Imagine the weight of the heavy Cross grinding relentlessly against Our Lord's tender shoulder, the brutal pain He felt as He staggered and fell to the ground, the awful effort of rising again. The great pain and terrible struggles of His last walk he carried out so willingly for you, filled with love and longing that pushed Him past His pain. Imagine the horror of the crude spikes callously hammered through Our Lord's wrists and feet, blinding and sickening him with pain, the terrible jarring as the cross in raised into place, and the endless agony of slow suffocation. Each tortured breath, gained at the cost of the searing pain of forcing his body upward, He offered to His Father for you. At last, it is finished.